I have long studied 'western' astrology (more than two decades now) and am just starting to feel comfortable with it's intricacies. Chinese astrology follows a radically different pattern and framework, and I have always been daunted at the idea of trying to learn it's complexities. 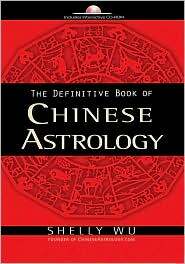 The Definitive Book of Chinese Astrology comes with a CD that does your calculations for you, which is a plus. Using the calculated chart, Wu takes the reader through the interpretation, step by step. This is a very complicated system, far beyond the two sentence 'year' forecasts we sometimes see on placemats or in February when the year changes. The downside, such as it is, is that The Definitive Book is . . . definititve. It is not a quick read, being full of information, including feng shui. So if you just want a quick look at your life chart, another book will have to do.